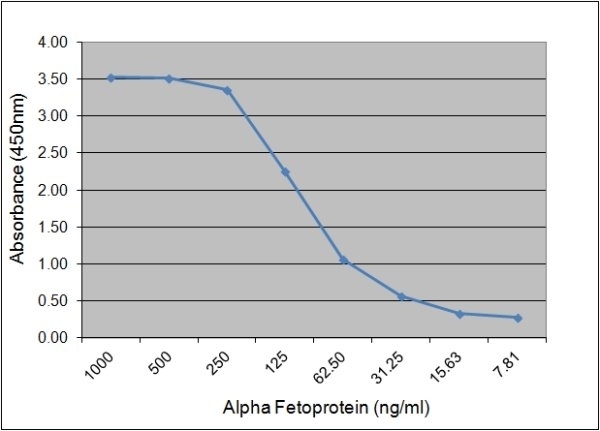 Mouse anti Human alpha fetoprotein antibody, clone 125.7A2 is a monoclonal antibody recognizing alpha fetoprotein (AFP), a member of the albuminoid protein superfamily, along with albumin and vitamin D binding protein. Members of the albuminoid superfamily comprise molecules with three characteristic globular domains (Mizejewski 1995). AFP is a ~70kD plasma protein found in fetuses over four weeks old, produced by the yolk sac and the fetal liver, with the highest concentration reached during the 12th to 16th week of gestation. AFP acts as a transport protein for various ligands such as bilirubin, fatty acids, steroids and heavy metals. After birth, plasma AFP levels drop rapidly with only trace amounts remaining in healthy adults. Changes in plasma levels of AFP have been documented in a variety of cancers including hepatocellular cancer (Sato et al. 1993). Mouse anti Human alpha fetoprotein antibody, clone 125.7A2 shows <0.1% reactivity with human serum albumin and IgG. Strong expression of AFP has been noted in the hepatic cell line HepG2.